Overview: Soldier of fortune Rex Mason will go anywhere and risk his life for the right price. Millionaire Simon Stagg has not only the money to hire Mason, but he also has the beautiful daughter Sapphire, who is deeply in love with Rex. Add in Simon’s aide Java, an unearthed caveman whose origin is never explored, and we have the makings of a cast for a new book. Rex Mason and Java have been sent to find the Orb of Ra in a hidden pyramid along the upper Nile. Mason finds the Orb but is exposed to a deadly dose of radiation. Rex survives but finds that his body has been changed. Initially, Rex can change his body into any element found in the human body. (Over time, that rule has been relaxed, allowing Rex to change into any element.) With near invulnerability, Rex Mason becomes the reluctant hero known as Metamorpho, the Element Man. While waiting for Simon Stagg to find a way to change Rex back into a normal man, Metamorpho serves the world as a super-hero, fighting the oddball menace of the month. At one point, he encounters Urania Blackwell, who has been similarly affected by the Orb of Ra, turning her into Element Girl. She starts out as a foe, becomes a sidekick of sorts, and then fades away into the comic book character limbo until she receives her final story in the pages of Neil Gaiman’s Sandman series. 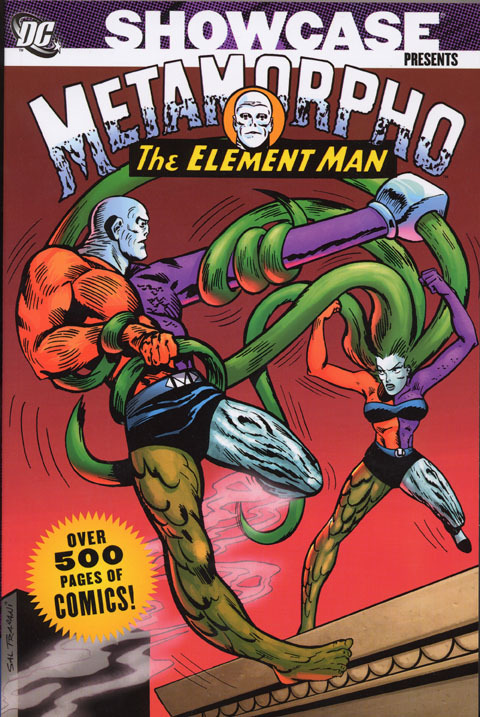 Along the way, Metamorpho crosses paths with other heroes in the DC Universe, such as the Metal Men and Batman. He is offered membership in the Justice League but turns them down. becoming the league’s first standby member. Why should these stories be Showcased? : Following his success with the Metal Men and the Doom Patrol, Bob Haney was tasked with developing another hero for DC. Borrowing pieces from each of those teams, Haney and Ramona Fradon created Metamorpho. While the stories remain firmly rooted in the 1960s, the character and, more importantly, the possibilities of the character are very intriguing. In many ways, Metamorpho feels like a Marvel character stuck in the DC Universe. Rex is an interesting character, and you should give this collection a look. Footnotes: The Brave and the Bold #66 is also reprinted in Showcase Presents Metal Men Vol. 2. The Brave and the Bold #68 is also reprinted in Showcase Presents The Brave and the Bold Batman Team-Ups Vol. 1. Justice League of America #42 is also reprinted in Showcase Presents Justice League of America Vol. 3. Metamorpho #17 promises the next issue, but the series was canceled there midway through a four-part story. Bob Haney had the chance to finish the story in a backup feature in Action Comics #413 (June 1972) and #414 (July 1972). If you like this volume, try: Metamorpho: Year One from 2007. Created by Dan Jurgens, Mike Norton, and Jesse Delperdang, this six-issue miniseries (and available as a trade paperback) gave a modern spin on everyone’s favorite element man. Serving as host of a TV reality show, “Treasure Hunt”, Rex Mason travels the world for fame and fortune, and to hopefully one day win the heart of Sapphire Stagg. But digging through a hidden pyramid, Rex stumbles upon the Orb of Ra and is once again transformed into Metamorpho. Can he find a cure to turn him back into a normal man? Jurgens has been an unsung hero at DC for over 20 years now and does not get enough credit for his stories. This is a fun modern-day look at a classic DC superhero. This entry was posted in DC Showcase Presents, Metamorpho and tagged Bob Haney, Charles Paris, Joe Orlando, Metamorpho, Ramona Fradon, Sal Trapani. Bookmark the permalink. Pingback: Throwback Thursday – Showcase Presents Metamorpho Vol. 1 – WORST. COMIC. PODCAST. EVER!